Donald Trump is doing everything in his power to block the migrant caravan invasion. But the thousands of migrants threatening to pour into the United States are pulling out all the stops to evade Trump’s enforcement efforts. 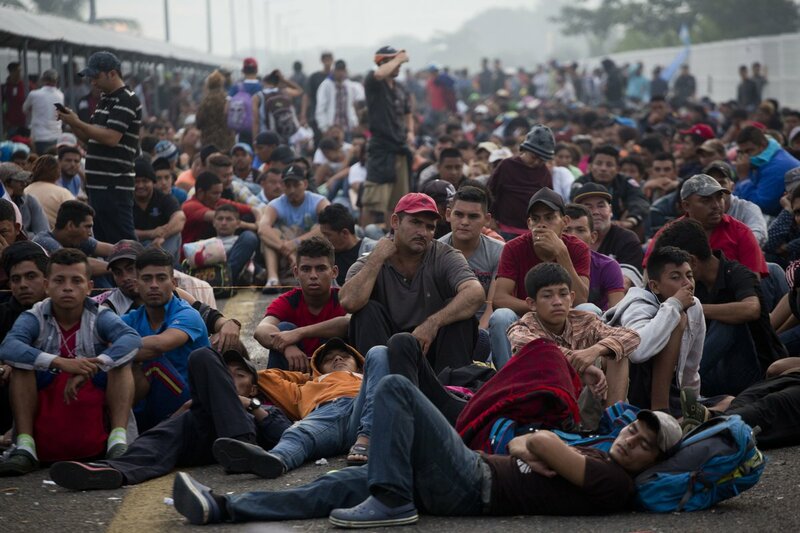 And now the caravan just hatched this awful plan to flood into America and never leave. NBC News out of San Diego reported on a woman named Maryui, her husband Miguel, and the couple’s three-year-old son who spent weeks as part of the caravan marching through Central America toward the U.S. border. They requested asylum after being caught illegally entering the country in San Diego. But instead of being turned around and shipped back to their home country, they are here to stay. That’s because Maryui was nine months pregnant when Border Patrol apprehended her. She gave birth to a baby boy who is now a U.S. citizen. The family was turned loose into America and given a court date for their asylum hearing. And there is a good chance they will simply disappear into the wind and never show up for their court hearing. That would make them one of hundreds of thousands of illegal aliens this year who skipped their court hearing and are now embedded in American society. Situations exactly like this – pregnant migrants abusing the 14th Amendment to sneak into America – is exactly why Donald Trump threatened to change the 14th Amendment’s birthright citizenship clause via executive order. “It was always told to me that you needed a constitutional amendment. Guess what? You don’t,” Trump told Axios in an exclusive interview on HBO last October. The pro-amnesty “journalists” for Axios disputed this claim, but Trump pushed back. “You can definitely do it with an Act of Congress. But now they’re saying I can do it just with an executive order,” he stated. Finally, Trump explained why the move was necessary. Conservatives have been spoiling for this fight for quite some time. Congress ratified it after the Civil War to make sure slaves were granted the full rights of U.S. citizens and to nullify the racist and disastrous Dredd Scott decision – which is viewed by many Americans as one of, if not the, worst decision in the history of the Supreme Court. They point out that the drafters of the amendment specifically noted that those “subject to the jurisdiction thereof” are granted birthright citizenship. Illegal aliens are subject to the jurisdiction of their home country. And even today the birthright citizenship guarantee is not universal. It does not apply to the children of Ambassadors. The Supreme Court has not weighed in on the question of birthright citizenship for the children of illegal aliens. Their only word on the matter was the 1984 Wong Kim Ark case. The court held by a 6-2 vote that the children of lawful immigrants were entitled to birthright citizenship. However, the original intent of the Senators who wrote the amendment made it clear that children of illegal aliens were not eligible for birthright citizenship. The official Senate record of the 1866 debate over ratifying the 14th Amendment shows that Jacob Howard – the man who drafted it – clearly stated that the children of “aliens” were not protected by the birthright citizenship guarantee. Pro-open borders politicians and lobbying groups pointed to that decision as settling the question once and for all that babies born to illegal aliens within the borders of the United States are automatically citizens. But just because they’ve yelled loud and long enough – with the help of the fake news media’s megaphone – does not make it so. Trump and other pro-American supporters believe the court should clarify this question. They contend the law is on their side. And the facts on the ground – that members of the caravan are breaking the law to enter the country, then remaining because of “anchor babies” – is raising the urgency to resolve this question for good.